The rocks are rounded, smoothed and damp with the morning’s cool fall dew. The road has seen water, and lots of it, in its tenure as both tributary and means of conveyance. In the face of the stunning surroundings I keep in mind the words of wisdom offered by my offroad companion, “stand up, keep your elbows loose, and keep up momentum”. It all works; the front-end hunts, the rear end slides about a bit, but the Dunlop 616s do their job. As do the engine, chassis, and long traveling suspension. About 200 meters of rockway later I’m floored, figuratively. Today, the Buell Ulysses XB12X has taken me from a stomping sport ride to the limits of my neophyte dirt riding abilities on British Columbia’s back roads, done by straddling motorcycle genres with adroit sensibility and inspiring competency. Rounding a corner we’re confronted with a brisk spectacle with autumnal colors on the verge of manifesting into full splendor. Photographer Kevin scouts ahead in the Jeep, leaving me astride the Ulysses and Evan Leung, occasional contributor, aboard his KTM 950 alone. We kill the engines and drink in the cool mountain air. At this moment the Ulysses feels like a day-pass from daily life’s bedlam. It gives me a moment to contemplate and I think this bike’s name may not be a misnomer. Ulysses is the Latin translation of Odysseus, the Homeric hero of the Odyssey known for his guile, ingenuity and wits. Being named after an adventurer who took ten years to return home from authoring the Trojan Horse is a lot to live up to. Knowing that he was a warrior to boot, whose name literally translates to “man of wrath”, sets the bar even higher. Earlier, on-road, Buell’s sporty adventure-tourer showed its worthiness; 50kph marked corners fell pray to its cunning intentions – at near triple the posted. The Ulysses was planted, solid, and stable and that feeling of confidence carries over to high-speed sweepers. Normally these are the wallowing, wandering and weaving undoing of adventure touring bikes when pressed hard. The Buell ate it up and asked for more, remaining planted across our favorite test of suspension, a serious compression bump in a high-speed corner. Out front the 43mm inverted Showa suspenders travel a long 165mm, while the rear ranges some 162mm; they compress a fair bit but the Ulysses never issues any sense of failing to hook tire to the road optimally. Indeed there was hardly any need to play with the rebound, compression and preload adjustments at all (though the rear preload is easily accessible, offering the potential for redialing on the fly to meet the needs of the terrain). The XB12X powered out of corners on cool morning roads impeccably, with only an occasional lifting of the front end – as if to remind you that this is still a Buell driven by a pitbull of an engine. At 6000rpms a colossal 69 ft-lbs of torque is delivered, and 800 rpm further up the range the 1203cc engine delivers its full punch of 83hp out the rear Dunlop. This is a Buell engine so the familiar at-idle rock and roll is delivered, shaking the mirrors, the signals on their stocks, and you. Soon as you clear the 2500 rpm range it starts evening out, and by 4500 it smooths to a consistent vibe through the bars. Indeed, it feels “tourable” all the way up to its rev limiter in the 6750 RPM range, and had me pining for more time and the optional luggage. The pickup through the first three gears is brisk. A minor complaint is that when held steady below 3500 RPM the fuel injection tends to surge (thanks Kyoto! ), originally I thought this would be an issue off-road but this tended not to be the case as you tend to always be accelerating or decelerating. The clutch is lighter and its throw shorter than previous Buells, making it easier to moderate the engine’s output at low speeds. A good thing, as a tall first gear makes use of the available torque to launch the Buell up to 60kph at the rev limiter. The transmission proves itself smooth and silky with short throws to it. It’s easy enough to pre-load the lever and let the Ulysses handle the up-shifts without the aid of the clutch as the rev limiter is hit. Downshifts likewise are an easy affair, with the low compression braking offered by the engine making rev-matching child’s play. Out on the road we hit 160kph, with very short excursions to its top speed of just under 200, and it’s hard to imagine taking 10 years to get anywhere. At this pace, Aeolus the god of wind, is at full blow testing your neck muscles and the fit of your helmet- loose and likely you’ll be consuming chin-bar. It’s enjoyable in a way, one of the most endearing traits of the Buell line is that fast truly feels fast. 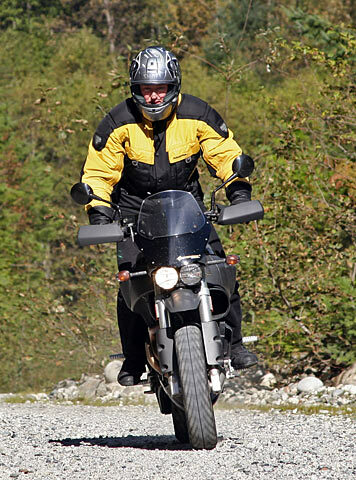 Still, wind protection is minimal, but the airflow is clean and buffet free – a great relief in comparison to the windscreen fitted on the V-Strom, which serves no purpose but to buffet. Indeed, at more reasonable sport-touring speeds, 120-130kph, the small cowl and windscreen combination proves comfortable. Throwing a leg over the Ulysses you are instantly confronted with its height; a 33-inch (841mm) inseam saw even myself at 6’2″ just barely able to flat foot the bike in a parking lot – that’s near the same as the BMW R1200GS to which this Buell has every right to be compared. Finally a Buell for the tall! Shorter pilots may have to settle with pointed toes, though this is not really an issue unless your offroading becomes more adventurous. The footpegs are low and your legs are relaxed and un-cramped. The seat is comfortable, well padded and ample for both pilot and pillion, without being intrusively wide when standing up is required. The 54.4-inch (1381mm) wheelbase has been stretched two inches over previous offerings, thanks to a reworked swing-arm/oil reservoir. This is still short in comparison the R1200GS’s titanic 1,519 mm, but makes everything roomy, especially in conjunction with the wide, relaxed bars. Shockingly, the words “comfort” and “Buell” can now share the same sentence. All that height pays off even if you’re occasionally left teetering, unable to flat foot the bike at a standstill. The dividend in all this is clearance – about 171mm (6.75 in.) worth of it. That is a fair amount of space between the ground and the Ulysses’ not-so-soft underbelly. The exhaust, carried under bike to lower the center of gravity, has been designed as a jack-point so it should be up to playing a secondary role as skid plate in rougher environs. We studiously avoided testing that theory however. In our normal use over gravel roads, it showed no signs of gravel or rock marks. On-road the braking feels soft but effective, and the massive 375mm rotor being clamped on by six-pistoned calipers generates a good amount of nose dive – as would be expected on any trailie-inspired ride. Common sense dictates using the single piston rear brake on the dirt, which offers good control. In the dirt, busting the rear end loose on the downhill stops just became a laugh, while the front can leave things a bit squirly. The Ulysses handles such frivolity exceptionally well however. At the beginning of our offroad test my feeling was “80% road, 20% dirt, be sure to take care”, by the end the care had been dissolved in a wash of the Buell’s enthusiasm for the dirt… or perhaps just clouded from vision by billows of dust. Terraplaning over gravel, the ride was best suited by gentle inputs to the bars and weighting the pegs. The Ulysses makes it all an intuitive experience, making hitting the muck immediately enjoyable. It’s all so dramatically not sport riding and oh-so police-free. The road roots are still there though, and some compromises turn up. The Buell is no light and fluffy super-motard. While accidentally locked in a quarry (who knew that gates do actually get locked from time-to-time) photographer Kevin learned the hard way that while the Ulysses’ clearance is enough to navigate a proper 4×4-style escape through extreme terrain, the weight at 498lbs (wet and fueled) adds to the challenge. This was over the course of navigating up a rocky shoulder height embankment and boulder-strewn, disused hiking trail. Still, the fact that the Ulysses allowed such an escape unblemished is a testament in its own right. The bar lock also seems conservative, making tight turns difficult – though it’s considerably better than that sported by the KTM 950. The metal footpegs could benefit from some rubber grips – they are wide, angled and supportive, but once coated with dust become slippery with unnerving talcum lubrication. That rubber might also serve to dampen some of the engines vibe to the feel, at first it’s just letting you know that it’s enthusiastic – after a while it could take a break to spare the “barking dogs”. Night offers up two other irritations. The oddly placed ignition on the left side of the fairing is near impossible to locate in the dark – likely I’d be fine by feel in a few weeks, but it would be nice to be able to see the key while seated. Once in motion in tight and aggressive corners, the focused illumination from the twin-headlights drops off abruptly – enough that I was near immediately considering additional lighting options. Still these issues are dwarfed by what Buell has done right. Fit and finish is solid quality. The welds are clean, the paint is deep and lustrous, and nothing feels too light or flimsy. “Will it hold together?” was the question issued from one KTM rider’s lips. To my mind the bike suffers its worst shaking at idle, and anything the road throws at it is minor by comparison. It also comes equipped with stock niceties. The “Triple Tail”, re-dubbed the beaver-tail almost immediately in a fit of back-woods Canadiana, is a well thought out cargo-mount/pillion backrest, and we can see other manufacturers following suit. Under the seat is storage spacious enough for a rain suit, while the under-tail itself offers a flat, easy to clean surface with bungee mount points. Indeed, that well thought out, easy-to-clean design ethic follows across the Ulysses’ smooth broad surfaces – it’s as if they meant for you to easily wash the mud off. Included also are frame-sliders, triangular shaped pucks protecting the 16.70 liter fuel-tank-come-frame in a down. Even cold weather considerations have been made. Hand guards are present and do a good job of protecting one’s digits from brisk fall airflow, while a power outlet is provided under seat – perfect for the electric vest set. Up front a second outlet is available, giving the option of powering a GPS or more likely a radar detector. The details have been nicely sorted out of the box. There are items that have yet to be proved to the adventure community on the Ulysses. The first is the 14mm Belt drive, which to our eye looks better than a chain for the off-road set. The system offers some serious advantages over a chain that need to be considered, namely no cleaning, no lubrication, no manual adjustment, and get this… no scheduled replacement. That last bit is a heck of a claim, and represents the faith that Buell puts in the aramid (the fiber formerly known as Kevlar) reinforced Hibrex rubber belt. The other item is the ZTL disk out-front which in extreme situations may interact with rocks, grooves, and other things that go bump in the night. The key word is “extreme”, looking at the disks inset from the tire, one would have to be in an “aggressive” environment to do any damage. I admit to having had reservations about this endeavor, but the Ulysses builds your confidence and what starts off as “can not”, becomes “maybe we can”, and ends up being “let’s do it”. The Buell Ulysses XB12X has infected me with a dirty mind full of the pleasures of gravel and mud, and while our time together started out with the best intentions to do a balanced review of road and dirt riding, it became an ongoing quest to see what’s around the next bend. Journalistic mandate be damned! There is more to the Buell than the near transcendental experience of making idyllic sojourns to spots that the fire roads have sworn to secrecy, it is in many ways the best streetbike the company has produced. Why? It is truly comfortable and freed of contortionist requirements of a full-on sportbike geometry; the Ulysses lets you get on with the business of clobbering the road into a senseless blur – for hours at a crack. So even if you’re not about to go all “long way round” there’s more to this bike than a quick nip to the coffee shop, and that is a vast improvement over previous offerings. Despite its road ability, it says a lot about the Ulysses that it took us places where we never expected it to, surpassing our neophyte off-road skills while egging us on to try more at every fork in the road. 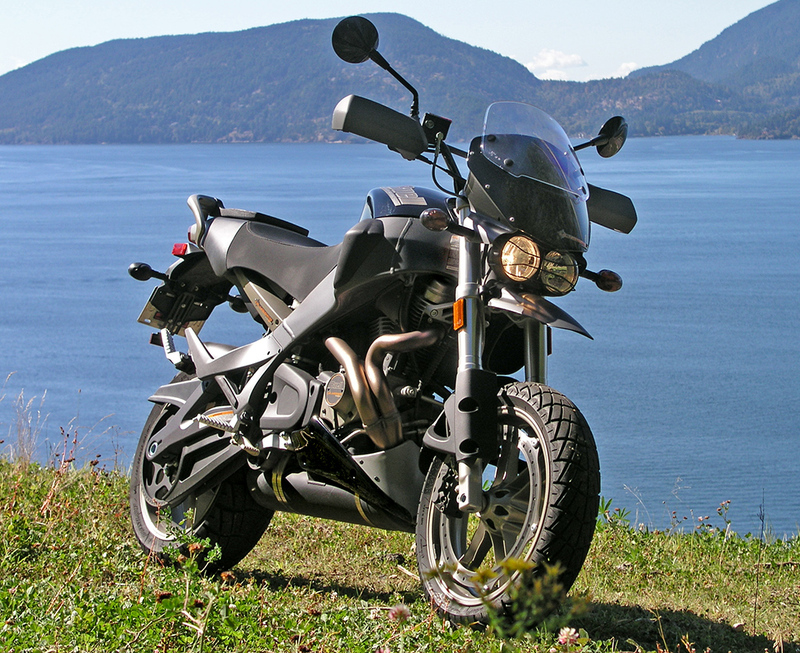 This, then, is the Buell you can live with and not just in the context of the adventure-touring genre. In becoming offroad-able the Ulysses makes the least compromises between sport style road handling, BMW R1200GS off-road capability, and comfort. The Ulysses is, like it’s namesake, cunning warrior and adventurer full of surprises – both on and off road. Unlike Homer’s hero though, ten year’s travels will not be the result of an angered Poseidon, but the love of adventure – nor will it be enough. Special thanks to Stuart Wells of Trev Deeley Motorcycles for arranging the loan of the Buell Ulysses XB12X.